Bird of Paradise Necklace is a plique a jour gold jewelry piece created by Patsy Croft. It belongs to a collection of amazing enamel jewelry with unique jewelry designs. The amazing enameling technique of plique a jour has intrigued people for centuries. 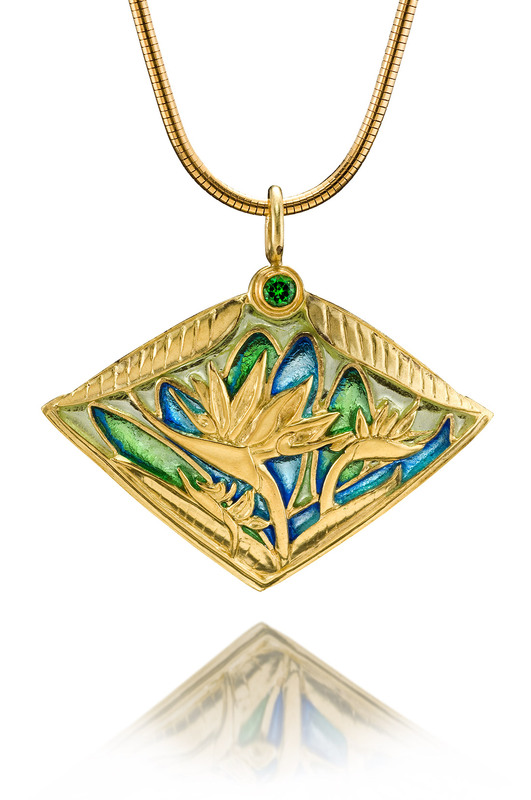 This mini stain glass look was used by the master of jewels Rene Lalique. Check out Rene Lalique’s wonderful Plique a Jour Jewelry. René Jules Lalique (6 April 1860, Ay, Marne – 1 May 1945, Paris) was a French glass designer known for his creations of glass art, perfume bottles, vases, jewellery, chandeliers, clocks and automobile hood ornaments.